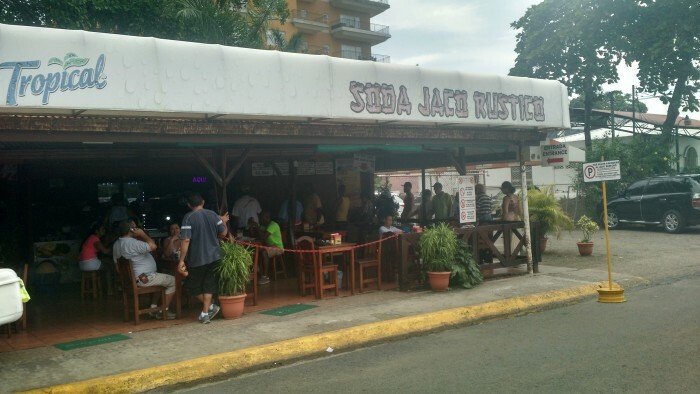 Soda Jaco Rustico, a restaurant situated in Jaco Beach, offers authentic Costa Rican meals—breakfast, lunch, and dinner—for locals at affordable prices. Though it’s often visited by the locals, travelers who pop up to the spot love it as much. If you are around the Jaco beach, this is the best place to enjoy your meals. Thanks to the parking, you can keep your car in a safe place and enter for dishes. The menu offers delicious dishes such as fried fish, chicken, rice, salads, crabs, beans, pork, meat, beef, plantains, and much more. The food is excellently prepared with fresh spices and ingredients; it has different, tasty flavors. After starting with fresh, tasty banana salad, you can then order Casado, which is made up of rice, meat, beans and some more foods. You can’t miss out on the chicken. It comes in a corn tortilla. As for a beverage, you can ask for the spot’s specialty, arroz con pina drink. If you need additional food, you can request pork accompanied with beef and chicken. This is a mouth-watering dish. The staff is always attentive and kind to the visitors. Since the spot is always full, the clients have to stay in line for food. While it may sound like a downside, the staff attentively serves the clients in a timely manner. They dish up the food in front of the clients. So, they get to see their food being served and then they can take a seat. The food is homemade. Because of its quality foods, the clients never have enough of this food; they keep returning. The restaurant is overlooking the beach. As such, it has a beachy environment. So, the clients can have an enjoyable time with their partners.